Police arrested the fake nurse who stole a newborn at the Vicente Sotto Memorial Medical Center in Cebu City. The baby has been recovered. 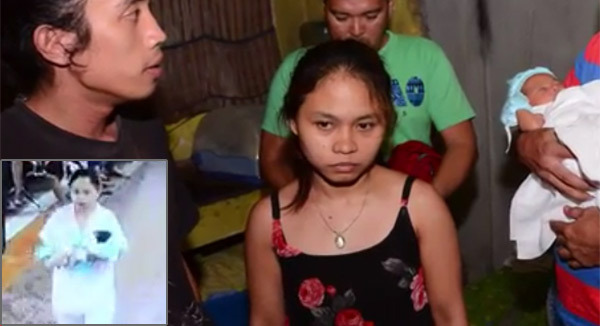 The suspect identified as Melissa Londres, 26 years old, was nabbed Tuesday night by members of the Cebu Intelligence and Detective Group after an alias Baby, one of her neighbors, tipped photographer Alan Tangcawan of Sun.Star Superbalita of her whereabouts. Tangcawan posted a video and his contact number on Facebook, urging his followers to provide information about the suspect who was caught in a CCTV footage allegedly kidnapping Prince Niño, son of Jonathan and Rosalina Celadenia. Londres was a call center agent and hails from Barangay Tipolo, Mandaue. Her 25-year-old live-in partner, Philip Almeria, was also arrested inside their rented room at a residence in Sitio Fatima, Barangay Lahug. Celadenia positively identified Londres as the one who took their baby at VSMMC. However, the suspect insisted that the child is hers and claimed that she had a delivery inside a taxi. Police mull charging Londres for kidnapping.